The history of Scottish kilts, is a subject that many people wish to know more about. And as the wearing of the kilt increases in popularity across the world, misinformation and myths surrounding its origins abound. The earliest reliable accounts of the kilt being worn in Scotland, date back to the end of the sixteenth century, and not to the thirteenth century, as the American film industry would have us believe. The kilt back then was very different to the one we know today, the Feileigh Mor, which nowadays is referred to as the great kilt, can often be seen at Renaissance Faires across America. It was a cumbersome garment, made from two loom widths of thick woollen cloth, up to seven yards long. The lower part of the material would be gathered up into pleats by hand, and fastened by a wide leather belt. The upper half could be worn draped over the left shoulder (thus leaving the right arm free to wield a claymore). As protection from the weather, it could also be draped over the head and shoulders. At night it would be taken off, and used as a blanket for bedding, once again protecting the wearer from the often harsh Scottish climate. It was worn over a leine, which was a long full sleeved shirt which came down to below the waist. Because it was such a heavy and cumbersome garment, it would often be discarded before a battle, leaving the Highland clansmen wearing only their leine, which was also known as a war shirt. Around the late seventeenth, early eighteenth century the philabeg or small kilt came into use, and became popular throughout the Scottish Highlands, and Northern Lowlands, although the great kilt was also still very much in use at this time. 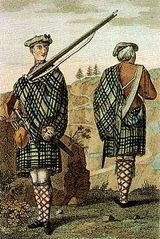 Below you can see an early picture of two Scottish Highland soldiers 1744, showing how the upper half of the great kilt was also used to protect the musket lock from wind and rain. The small kilt was a single width of cloth, which fell from the belt to the knee, this was a clear development from the great kilt, as it was essentially the bottom half. In the history of Scottish kilts, the first evidence of pleats being sewn into the philabeg making it the first modern kilt came in 1792, until then the kilt was folded rather than pleated. This development made the kilt much easier and faster to put on, and was quickly adopted by the Scottish Regiments. The new tailored military kilt, and its accessories crossed over into the civilian market during the early nineteenth century, and became the kilt we all know and love today. In 1746 the government, afraid of further revolt and uprisings by the Scottish clans, banned the wearing of the kilt and tartan. In fact if it weren't for the Scottish Regiments, the kilt would have been lost forever, and what a sad loss that would have been. If you have any questions on the history of Scottish kilts, or on kilts in general, then drop me a line using the Contact Us page, I will be delighted to answer them.